How can we make sense of revelatory experiences? The conference tried to approach and talk about revelatory experiences from two main directions: history and neuroscience. So, first of all, we heard from two research teams – one led by Dr Quinton Deeley at KCL, the other by Professor David Oakley at UCL – who are studying the brain-imaging of hyponotised people. 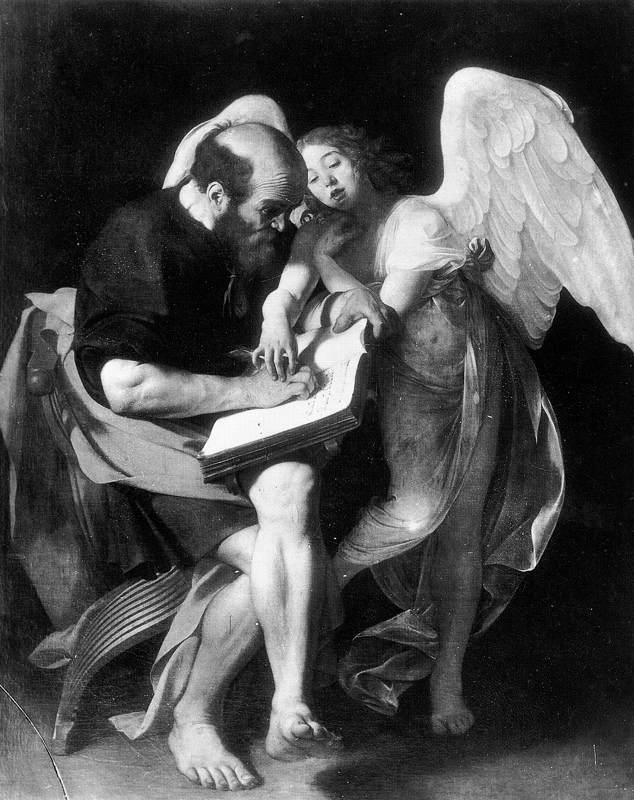 They’re trying to understand the phenomenon of ‘automatic writing’ – the feeling of some external being controlling one’s hand or even guiding one’s thoughts, as in the Caravaggio drawing of St Mark and the angel, on the right. The researchers have done interesting work in finding the neural correlates of hypnotised and dissociative states. But I think there’s a difference between being hypnotised and having a revelatory experience. People who are easy to hypnotise are typically easily suggestible and socially conditioned, while people who have revelations are (to generalise) often quite socially dysfunctional, stubborn misfits. And of course, in the UCL and KCL experiments, we know where the suggestions are coming from – from the scientists. We don’t know where the external suggestions are coming from in revelatory experiences. We then heard a fascinating presentation by a young neuroscientist called Dr Robin Carhart-Harris, who is working with Professor David Nutt at Imperial on the well-publicised research into the neural imaging of psychedelic experience (you can watch a video of Robin presenting his work here). Robin said the imaging suggests a decrease in filtering or connecting activity in the brain when people are on psychedelics – not opening the mind, so much as closing down some parts of it so that other parts of it can be released. And his team also noticed an unusual relationship between the default brain network (DBN) – the system we are in usually, where our consciousness free roams inside our head, day-dreaming and introspecting – and the task-positive network (TPN), which we use more occasionally to focus on external stimuli. Usually these two systems are anti-correlated. But during psychedelic experiences, they appear to become correlated, aligned and synchronised – we are both externally focused and day-dreaming, so that the outer and inner worlds become fused. The ego boundaries are dissolved. We return to a state of infant wonder, projecting the shadows of our dreams onto the cave-walls of external reality. Robin noted that, for many participants in the Imperial study, and in another project running now at John Hopkins, the psychedelic experience in the laboratory is one of the most meaningful and spiritual experiences of their lives. In the John Hopkins study being run by Roland Griffiths, for example, 70% of participants report mystical experiences, and 60% describe it as the most spiritually meaningful experience of their lives. That’s pretty remarkable. We then had some historical perspectives on revelatory experience. Dr Jane Shaw, Dean of Grace Cathedral in San Francisco, presented her work on the Panacea Society – a religious community that sprang up in Bedford during World War I around the figure of Mabel Bartlerop, who announced one day she was Octavia, daughter of God, and who claimed to receive dictation from God every afternoon at 5.30. And then Dr Phil Lockley, part of the same ‘Prophecy Project’ at Oxford as Dr Shaw, gave a useful talk outlining how recent historians have tried to contextualise revelatory experiences, in works like Barbara Taylor’s Eve and the New Jerusalem (1983), Phyllis Mack’s Visionary Women (1992), Diane Watt’s Secretaries of God (1997), and (going back a bit) Norman Cohn’s The Pursuit of the Millennium (1957). Dr Lockley showed that historians can tell us interesting things about how revelatory experiences are culturally constructed and influenced by their time. For example, Dr Shaw told us how the language of inspiration in the Panacea Society was inspired by the invention of the wireless – the mediums talked of ‘tuning in’ to God – a phrase which was subsequently taken up and popularised by Timothy Leary and the LSD counterculture. The movement was also part of the ferment during World War I – it was fiercely patriotic, and members of it lobbied the Archbishop of Canterbury to open the ‘sealed box of prophecies’ left by the 18th century visionary Joanna Southcott, which she said should be opened in a time of national crisis by the 24 bishops of the nation (here’s the box on the left). I personally think the opening of the box should be the climax of the Olympics inauguration ceremony. Both these approaches – the neuroscientific and the historical – tell us some fascinating stuff about revelations. But it seems to me that both approaches leave something out. There is the important question of the quality of the revelatory experience. Academia often leaves out such qualitative questions – for example, academics are so busy contextualising a novel, say, or a therapy, they won’t ask if it’s any good, which is really the most important question. They say it’s ‘interesting’, by which they mean it is useful for their particular line of research. There’s a value judgement we have to make about revelatory experiences – both other people’s, and our own. I asked Dr Shaw why, if Mabel’s inspired poetry wasn’t much good in her estimation, had she spent years studying it. Did she think it was actually from God? She said she was a historian, so couldn’t answer that. But later on, she came back to the question, and said she thought Mabel did have a ‘spiritual authority’, which was apparent in her letters to her flock more than in her inspired writing. Dr Shaw made a value judgement about the quality of Mabel’s work – which involved an evaluation of Mabel’s relationship to God. That was at the foundation of her enduring interest in the Panacea Society. So in general, can we make value judgements about revelatory experiences? I mean, besides going and asking God if he really did send this message or if we should put it in the spam folder. Firstly, we can make judgements about truth-claims that prophets make. For example, Mabel of the Panacea Society claimed that members of the Society would never die. Turns out she was wrong. That, to my mind, reduces her authority and the authority of her experience. There’s that amazing scene in The Brothers Karamazov where the dead body of the inspired priest starts to decompose and smell, thereby conflicting with the spiritual tradition that the bodies of the inspired don’t decompose. Well, that undermines the spiritual authority of that charismatic tradition. It shouldn’t have made those claims. Secondly, we can make aesthetic judgements about the quality of inspiration. Is it cliched or gibberish? Or is it beautiful, complex, coherent? Rosemary Brown, an uneducated housewife from Balham, claimed in the 1960s to be a medium in touch with the spirit of Liszt and various other composers. The BBC went to interview her and asked ‘Liszt’ to come up with a composition. And eventually s/he did – and, according to a psychiatrist who was at the conference, the piece she wrote was incredibly complex, with the left hand playing in 5/4 and the right in 3/2 – far beyond Rosemary’s technical ability to play, and the sort of thing that scholars say Liszt might have written. The aesthetic quality of the composition makes her claims to inspiration more credible, in my view. Or at least, more interesting (there’s that academic word again). Thirdly, can the person make sense of their vision, can they articulate it, can they defend it? Think of the young Jesus holding his own in the Temple against the elder authorities. Think of Socrates – inspired by his daemon, yet capable of rationally articulating his beliefs. I know Kierkegaard would argue that revelation is irrational, that the whole point of it is you can’t articulate it, you can’t make sense of it or defend it. Well, I think part of the challenge for someone who has a revelatory experience is to try and make sense of it and communicate it, to carry it down from the mountain. That also means you need to be able to defend its ideas, without simply saying ‘an angel told me’. Fourthly, does it lead to human flourishing – your own, and other people’s. One of my friends is schizophrenic, and is sure the voices he hears are angelic. But the voices are very mean to him, they block his flourishing. Of course, he would say to me ‘how do you know? How can you tell the state of my soul or your soul?’ I’m not sure how to answer that question. But we can test out what the voices say and show they don’t always tell the truth, for example. In which case we grant them less authority. Perhaps it doesn’t matter where revelatory experiences come from, it’s what you do with them and what they lead to. What is the quality of the work you go on to do? How much does it help people? How much does it help you? It is difficult to evaluate this, in the absence of a scientific measurement device that measures godliness (a sort of spiritual Geiger counter). Yet as humans we do evaluate the quality of various revelations, and our evaluations decide what revelations we use to guide our life. I’m not into the Panacea Society, for example, while I am interested in Plato, Rumi, the Buddha and other inspired writings, because of my own qualitative evaluations about the writing and the organisations they inspired, evaluations which I am prepared to defend rationally. Take Alcoholics Anonymous. It was inspired by a religious vision experienced by Bill W. when he was on belladonna, which he took as part of a radical psychedelic cure for alcoholism. OK, that’s interesting. But it’s more interesting what he did with it, the work he did, the movement he constructed, which I think is one of the most interesting and successful movements of the 20th century, in terms of the human suffering it reduced and the flourishing it increased. You can qualitatively evaluate the work without having to evaluate if Bill’s vision ‘really was’ from God. The world is full of people who claim to have received messages from God. They usually think they’re uniquely blessed with this message and get very grandiose. Well, you’re not, lots of people have such experiences. Some of those messages seem useful, others less so. We need some kind of spam filter, and a way of evaluating the quality of the message without relying solely on the purported address of the sender (contact@God.org). This entry was posted in Emotional Currents and tagged charisma, psychosis, revelation by Jules Evans. Bookmark the permalink. Surely, when it comes to revelations, the most important issue at hand is trying to figure out whether the revelation contains only information from within our own brain, or whether information from outside our brain was somehow revealed. In the first case, we can treat revelation just like we treat any other thought or dream. In this case surely there is no reason to treat it differently? In the latter case, it would be best to then try to ascertain the source of this external information (e.g. natural by morphogenetic fields etc., divine or demonic). Then we can start to think about the nature of the information revealed, i.e. is it beneficial for myself or mankind? However, as far as I know, the latter case has never been proven, even though it should have been easy to supply such evidence (i.e. facts the person having the revelatory experience couldn’t have known, or accurate predictions about the future). That this was never the case in human history points towards revelations containing no information from outside our brains, in which case we should treat them no differently than other thoughts. Yes, you’re right – we cant prove that revelations are anything other than internal thoughts. People experience them as external thoughts – as messages from beyond – but theres no way we can prove they are from beyond…unless I suppose the message from beyond conveys information that that person couldn’t possibly know. I’m sure there are a few instances of this, but it doesn’t seem that common. the point i was trying to make is more pragmatic – what do people do with the ‘revelations’ that come to them? how well do they integrate them? how well do they carry their message down from the mountain and bring it to their society? how much human flourishing does it improve? quite pragmatic, rational, utilitarian questions – but im not sure how else to evaluate such experiences. thanks for the reply – that is very nice of you. You say that “we can’t prove that revelations are anything other than internal thoughts”, and yet you say you are sure there are instances where revelations conveyed information the person could’nt have known. Which is it? The latter should be relatively easy to prove, I would think… but if it hasn’t been proven, it’s likely such things don’t happen. And the point you make… if revelations are internally, why do you see a need to evaluate them differently from all other human thoughts? Is there something I’m missing? To me, it sounds like you believe relevations could be external (without actually saying so in the article) and thus all revelations need special consideration. But this means the key question is internal/external, even though you say in the article this question “perhaps doesn’t matter”? Sure, thanks for making me think harder about it. I think revelations may come from something other than the ego. I have no idea what that is though. Nonetheless, I think one has to try and make sense of revelations rationally, just like any other thought. I think because the experience of them is so intense, of course the person experiencing it will give it ‘special consideration’. But you still have to see if it makes sense to you rationally. I notice you don’t answer the question whether there is no proof that information comes from an external source, or whether one can be sure there are instances of this. Again, isn’t this is the key question? If there is no evidence that information comes from external sources, Abraham has to go no further in his thought process – he should immediately get an appointment with a psychiatrist. If there is reasonable evidence for external information, then it becomes tricky. If there was, in addition, evidence that the god of the bible existed and that the message came from him, then no moral evaluation would be necessary. We have to do what god wants us to do, otherwise we’ll go to hell. If we follow his wishes, we go to heaven, including our possibly murdered children. It’s simple, and no human moral reasoning is required. With regard to the first question, I said that there are probably a few instances of people who hear voices that know things the people couldn’t know. Here’s one such story, which the journalist Jon Ronson unearthed. It’s the last item on the show, in the last quarter of it, but I’d really recommend listening to the entire show. Yes, I agree that if a person is hearing voices telling them to kill their son, they should seek immediate psychiatric help. But as the researchers at KCL have found, many people have ‘out-of-the-ordinary experiences’ where they feel they have received communication from an external source, and these experiences have been inspiring, meaningful, emotionally rewarding, and have led them to go on to do helpful, useful work. The team at KCL found that people who had such experiences who did go straight to a psychiatrist (or were referred to one) typically had a worse prognosis than a person who didn’t get medical help. So theres a problem with how our society treats people who experience such phenomena. They can receive a lifetime diagnosis of schizophrenia, and a lifetime prescription of very debilitating anti-psychotic drugs, and both those things can be incredibly damaging to their life opportunities. What I am trying to suggest is that we recognise that sometimes these experiences can be useful and valuable. They can inspire people to useful work – even if we can’t be sure where such experiences come from. Going back to the experience of Bill W., the founder of Alcoholics Anonymous. He was cured of his alcoholism after he was treated with a psychedelic drug, and had a religious vision. He interpreted this through a Christian context, but we can’t know where this vision came from. For all I know the universe is teeming with beings, some who are helpful, others less so. Or perhaps there are no such beings, we are alone in the universe, but we sometimes imagine we have visions of external beings who help us. Either way, Bill was inspired to set up one of the most useful organisations of the 20th century. I don’t think we can classify all such experiences as symptoms of a disease to be treated with anti-psychotic drugs. I don’t think such experiences are necessarily a disease, in the sense of harming a person’s well-being. Sometimes, as in Bill’s case, they seem to enhance it. 1) I think that in order “to make sense of revelatory experiences” it’s of highest importance to know whether revealed information comes from an internal or external source. I understood your position to differ from this; you think that a moral evaluation of revelations is of higher importance than knowledge about the source. a) My example about the biblical god and Abraham was about this point. It refuted your argument that a moral evaluation is most important in such a case. In my example, if Abraham knows the source the of the infoamtioan, no such evaluation is of relevance. b) You write you agree with me that if a person is hearing voices telling them to kill their son, they should go to a psychiatrist. However, I didn’t say that – I said that such a person should go to a psychiatrist under the condition that we know revelations are from internal sources. If we have evidence it’s god talking to us, or that bad people beam their thoughts into our head via telepathy, than there is no need to go to a psychiatrist. There is only reason to fear for the mental health of such a person if revelations are internal. Again, this was meant to strengthen my argument and to refute yours – here again, knowledge of the source is more important than moral judgment. 2) It is interesting to me whether there is evidence or not to support the hypothesis that some revelations contain external information. After all, discovering evidence for a non-human consciousness that communicates with us, would probably be the biggest discovery in human history. We have searched for god for thousands of years and never found any evidence. If revelations come from human sources, via telepathy or morphogenetic fields, etc, we would have discovered an additional sense of humans, and probably an additional, the fifth, force of nature. Maybe we could use this new force of nature like we use electromagnetism today. This would also rank as one of the biggest discoveries in history. This is a view that differs from what you say in the article “perhaps it doesn’t matter where revelatory experiences come from”. I think it matters greatly, and thus I was interested in whether you think there might be evidence for an external source of information or not. I’m still unclear about how you explain the apparent contradiction of you saying in the same paragraph there is no evidence, and that we can be sure it happens. If there is no evidence, how can you be sure? I have not watched the video yet – I will do so only if you tell me you believe it constitutes evidence – otherwise there is no point for me to see it. I’m sceptical on this matter, using the yardsticks of “extraordinary claims require extraordinary evidence” and “what can be asserted without evidence, can be dismissed without evidence”. Your latest reply seems to argue in a number of paragraphs that some human thoughts can be good. Surely nobody would claim otherwise? As I said before, if revelations are from internal sources, they ought be treated like other human thoughts. Then you say revelations are not a disease and should not be treated with drugs. I’m not an expert on this – are you saying there are people who argue this view? If you mistook me to hold this view, let me clarify – if people are experiencing murderous, destructive thoughts with great intensity (the Abraham example) and we know that the source of such thoughts is internal, then they should look for professional help. As I said before, revelations should be treated like other human thoughts, and surely humans should go and seek help if their thoughts compel them to be murderous or self-destructive. Sorry for the long reply – I just didn’t want to be misunderstood, and I’m confused as to what your position is. I’m also sorry you’re finding it so difficult to understand me. Yes, as you say, it may be because English is not your native language. 1) How can we know whether a vision / inner voice is an external communication or an internal thought? I suppose we can know in instances where they make claims about the external world – about the future for example. We can see if these claims are true or not. The story I posted in my previous post seems to be this kind of phenomenon – the voice tells a person information about the world which that person couldn’t know. But, as you say, such phenomena is extremely rare, at least in my experience. But there are other kinds of revelatory experiences which aren’t like this. For example, Socrates hears his daemon tell him not to leave Athens when he is found guilty of impiety. This is not a truth claim, so we can’t be sure if the daemon is the internal promptings of his conscience, or something external. A person may feel that a vision / revelation is very different to their normal thoughts, they may feel that a revelation reveals something very meaningful about their life or ethics or reality to them, and that this is from an external source. But i think, almost always, we can’t prove where such communications come from. So we have to keep an open mind, and try to make sense of the experience without being certain where it comes from. With regards to your question about treating revelations as symptoms of a pathological disease, yes, that’s absolutely how they are treated by contemporary psychiatry. If a person were to report hearing or seeing or experiencing external spirits communicating with them, there is a good chance they would be diagnosed with schizophrenia, locked up, and given anti-psychotic drugs – perhaps for their whole life. I feel like I’m making the same points over and over, so with respect I’m going to leave this exchange now. Jules, thanks for the longer article. Of course there are many more questions to be asked in this area (inevitably) but I think this is an important discussion and that this pragmatic approach is better than some I’ve seen. It’s valid to apply scientific analysis to the likes of religion, spirituality, revelations, voices, etc – these ‘external’ experiences – to try to understand them better and make some positive use of them. What bugs me is when I see what I feel is a misappropriation of the scientific process, when it’s used as a weapon against practices like religion, as if science is some kind of ultimate truth; as if we are anywhere nearly evolved enough to have a process for such a level of understanding of the universe. I read somewhere of a council – Richard Dawkins was a key member but I can’t find the details – that was inaugurated with a claim that the most important thing humans can do is eradicate religion. That sounds to me like a claim that science is all we need, when really it’s only a framework for gaining an ever better understanding of the processes in our universe, and ways we might make use of them. The above might be rather tangential, or completely disparate, from your line of thought. And I’m certainly not qualified to comment authoritatively. But I thought it worth adding. If it needs to be said, I’m not coming at this in defence of religious beliefs, I have none.